- Be aware that the 2" (2.0 inch) Lift Height in the "Product Details" section above is the amount your vehicle will be lifted. This may not be the actual thickness of the Lift Spacer you will be receiving. This is because your suspension geometry may not be 1:1 ratio. - If you have questions about the Item Thickness, please send us a message. - The Lift Height we specified above is only applicable if you have not added / changed other suspension components. 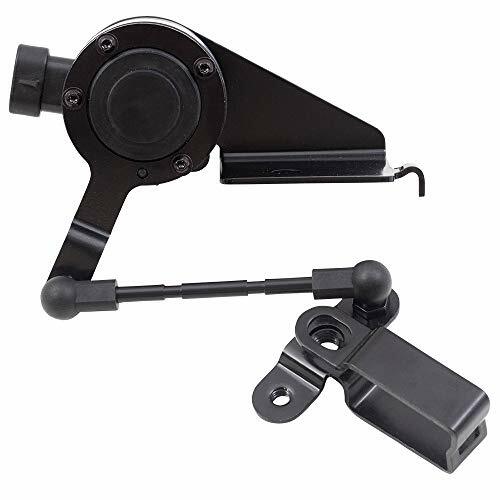 - An alignment is necessary after the installation of this item to achieve the full lift height. - No Returns or Exchanges once installed. [DODGE APPLICATIONS] 4WD Only. 1994-2001 Ram 1500. 2006-2010 Ram 1500 Megacab. 1994-2013 Ram 2500. 1994-2013 Ram 3500. This will only work if your truck is 4x4. 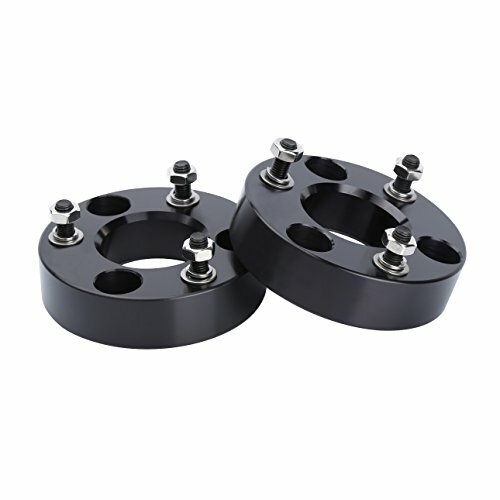 Includes 2 Coil Spring Lift Spacers + 10.9 Grade Studs + (6) Grade 8 Nuts. Made from Heat Treated Carbon Steel, machined to exact specifications for optimal durability and fitment. Designed to be solid and not bend or warp under stress. 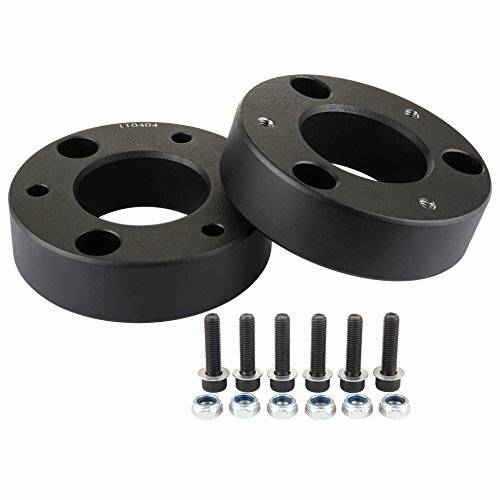 [IMPORTANT] Make sure to torque nuts to correct specifications = 32 ft/lbs. The use of loctite is recommended to protect the threads from rust/corrosion and prevent loosening from vibrations. 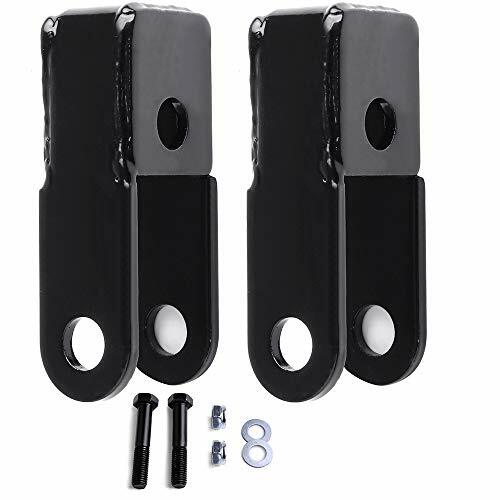 This Dodge lift kits provides a front 3" suspension lift it improve the appearance of your vehicles and support the dependable riding balance, the aircraft billet aluminum will not compress or bend even heavt duty. contact us if you meet any problem in installation! - Be aware that the 3" (3.0 inch) Lift Height in the "Product Details" section above is the amount your vehicle will be lifted. This may not be the actual thickness of the Lift Spacer you will be receiving. This is because your suspension geometry may not be 1:1 ratio. [CHEVY & GMC APPLICATIONS] 07-17 Silverado 1500. 07-14 Suburban 1500. 07-17 Tahoe. 07-17 Sierra & Sierra 1500. 07-17 Yukon. Includes 2 Lift Spacers. With pressed in Studs, + Nuts (as seen in pictures). [IMPORTANT] Your suspension geometry is not 1:1 ratio. Meaning the Actual Item Thickness is NOT equal to the lift height. The item you receive is not going to be 3 (3.0 inch) thickness. In addition, an alignment after installation is necessary to get the correct lift. NOTE: May work on other vehicles. Check against measurements above. Message us with any questions. - DOES NOT Include Lift Plates. This is ONLY for the U-bolts / washers / nuts pictured above. - CHECK Your U-Bolt Shape. These are square-shaped ubolts. Make sure it matches your current ubolts. - CHECK Your U-Bolt Install Location. 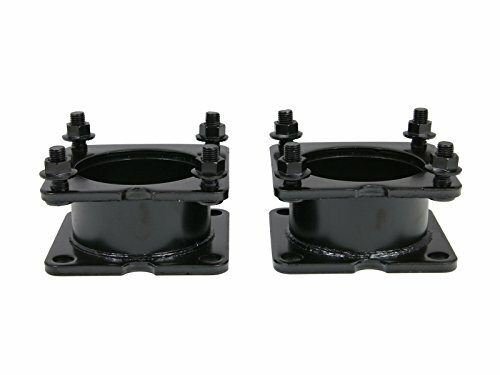 These ubolts are to be installed on top of the springs. 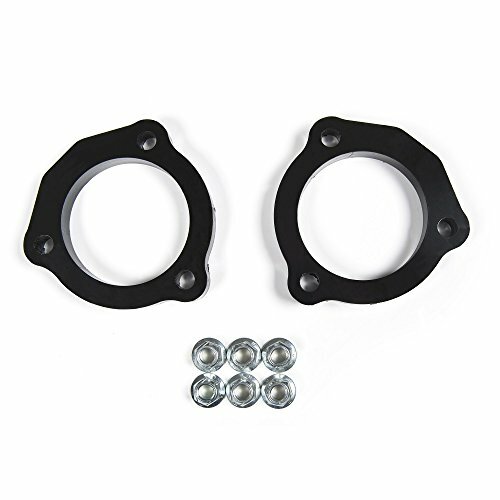 - Designed for use with 1.0 - 3.0 inch Suspension Lift Blocks / Plates / Springs. - An alignment is recommended after the installation of this item. [HARDWARE] Includes nuts and washers. Manufactured to grade 8 specifications to ensure durability and safety! 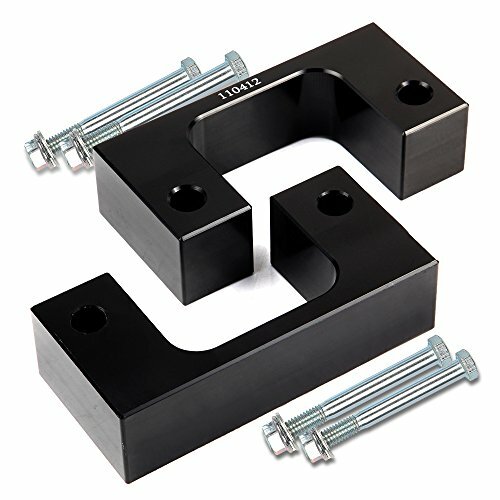 [DURABILITY] U-bolts and all hardware are zinc plated for ultimate rust prevention. Fitment: 2005-2018 Ford F250 Super Duty 4WD 2005-2018 Ford F350 Super Duty 4WD NOTE: Does not fully level 2017 models Features & Benefits: Improves the look of your vehicle and increases ground clearance. 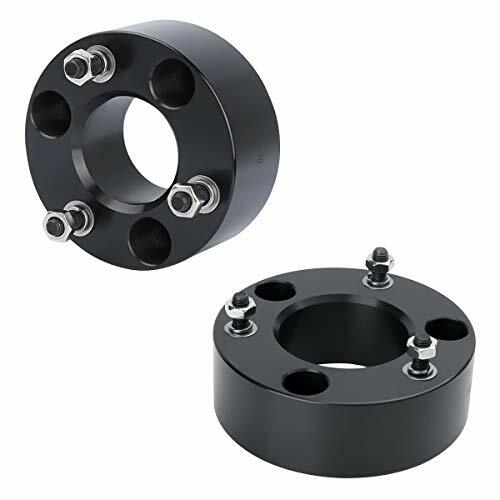 Levels the front with the rear of the vehicle; Spacers are designed with a slight lip allowing the spacer to lock into the factory seat for a perfect fit; Simple bolt-on installation and requires no cutting or modification of factory installed parts. 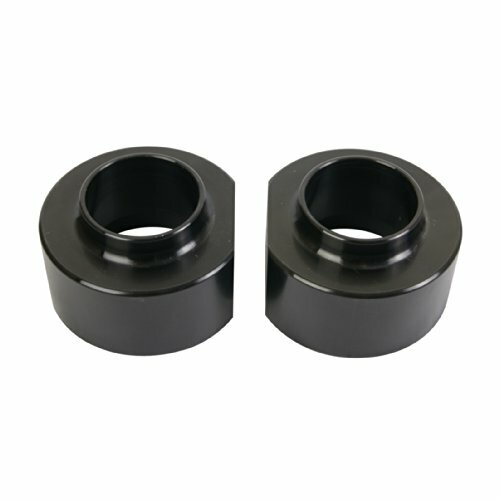 MATERIAL: The spacer is manufactured from billet aluminum to match you factory suspension. Resistant against wear and tear. FEATURE: Improves the look of your vehicle and increases ground clearance. Levels the front with the rear of the vehicle.The slight lip makes the spacer easily locks in. This lift kit Will raise the front of your F250 or F350 Superduty by a true 2. 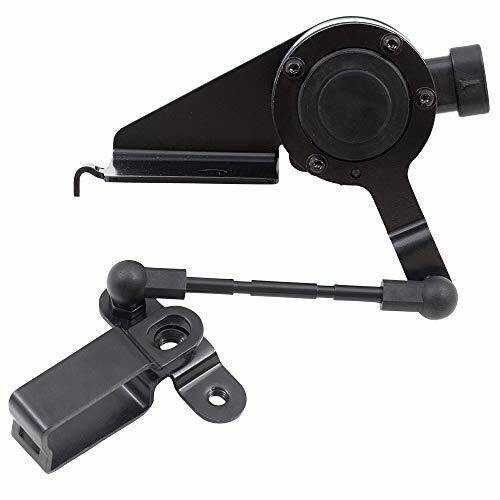 EASY TO INSTALL: Simple bolt-on installation and requires no cutting or modification of factory installed parts. Chevy Colorado/GMC Canyon Zone Suspension 1.25" Leveling Kit Features: FITMENT: 2015-2016 Chevy Colorado/ GMC Canyon 2WD/ 4WD 1-2" Product Details: Weight: 4 pounds Brand: Zone Offroad Item Weight: 3.5 pounds Package Dimensions: 12 x 8 x 2 inches Item model number: C1121 Manufacturer Part Number: C1121 Handling We will ship all orders within 3 business day of payment. We Do Not Ship Outside of the Continental US. Return Policy All items qualify for returns within 30 days of receipt. Buyer is responsible for return shipping on any item that is not damaged. Feedback We take our reputation seriously, we buy and sell online, so we understand the value of trust. If you are unsatisfied with your order, please contact us and we will work with you to resolve it to your satisfaction. - Be aware that the 2.75" (2.75 inch) Lift Height in the "Product Details" section above is the amount your vehicle will be lifted. This may not be the actual thickness of the Lift Spacer you will be receiving. This is because your suspension geometry may not be 1:1 ratio. If you lost the instructions please feel free to contact us and we will send you electronic one. we will provide competitive price and professional service for you! the aircraft billet aluminum will not compress or bend even the Max load. Please remember to communicate with us when you meet any problem in your installation! EZ level which has 2000 pounds level load capacity can be adjusted independently for uneven side to side loads. Complete bolt on and backed by lifetime warranty. Variable rate leaves do not affect ride when unloaded. Has high quality spring steel leaves. Adds new life to old springs and reduces body roll. [IMPORTANT] Your suspension geometry is 1:1 ratio. Meaning the Actual Item Thickness for the front lift spacers is equal to the lift height. In addition, an alignment after installation is necessary to get the correct lift. - Be aware that the 2.5" (2.5 inch) Lift Height in the "Product Details" section above is the amount your vehicle will be lifted. This may not be the actual thickness of the Lift Spacer you will be receiving. This is because your suspension geometry may not be 1:1 ratio. [IMPORTANT] Your suspension geometry is not 1:1 ratio. Meaning the Actual Item Thickness is NOT equal to the lift height. The item you receive is not going to be 2.5 (2.5 inch) thickness. In addition, an alignment after installation is necessary to get the correct lift. [MANUFACTURING] Made from Heat Treated Steel for optimal durability and fitment. Designed to be solid and not bend or warp under stress. Pre-installed bolts are 10.9 Grade and included nuts are Grade 8. [WARRANTY] 1 year warranty on manufacturer defects. Feel free to reach out if you have any questions and we'll be more than happy to help you out! 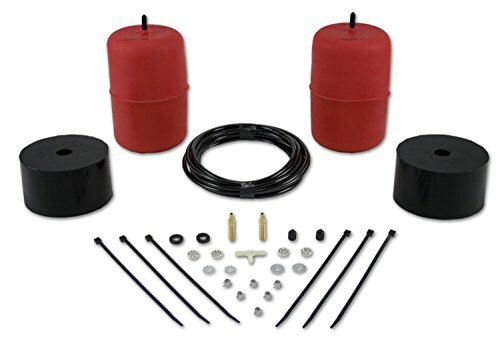 AIR LIFT 1000 Series Rear Air Spring Kit is designed to adjust the air spring level of the vehicle while towing. 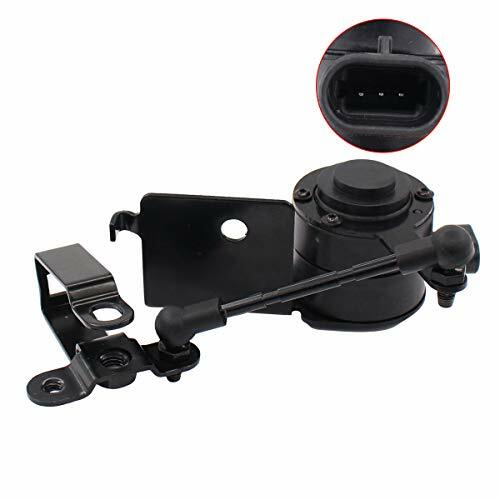 It includes hardware and durable component. This kit eliminates sag and features 2000 pounds of leveling capacity. 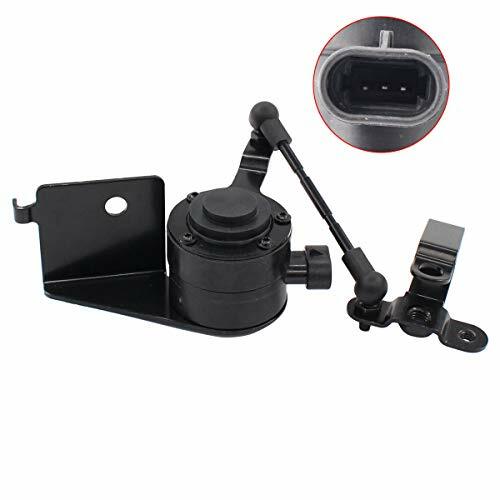 It installs inside coil spring to eliminate bottoming out and is highly durable. [APPLICATIONS] 2001-2012 Ford Escape. 2000-2012 Mazda Tribute. 2004-2012 Mercury Mariner. [MANUFACTURING] Made from Heat Treated Steel for optimal durability and fitment. Designed to be solid and not bend or warp under stress. [IMPORTANT] Your suspension geometry is not 1:1 ratio. Meaning the Actual Item Thickness is NOT equal to the lift height. The item you receive is not going to be 2 (2.0 inch) thickness. In addition, an alignment after installation is necessary to get the correct lift. PLEASE NOTES The front Leveling lift kits are less than 2",the leveling lift kit's itself actual height 1.38 inch,but they will raise the truck by 2" in the front.The lift height and kit thickness are not 1:1 due to suspension geometry. HIGH QUALITY ECCPP's leveling lift kits are Machine-manufactured precisely from 6061-T6 aircraft-grade aluminum billet,with heat-treated and hardened 10.9 grade bolts pre-installed. The anodized surface provides additional resistance to corrosion. 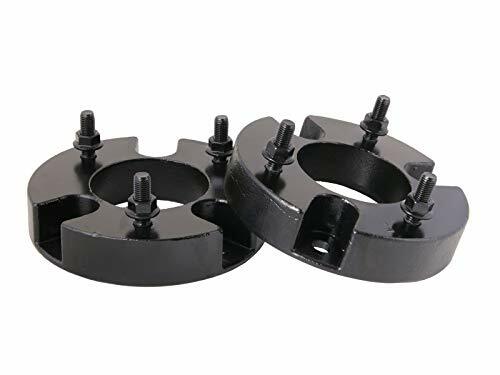 BENEFITS The leveling lift kit 2 inch Improve the performance of your vehicle and increases ground clearance,allowing you to fit larger custom rims and tires. WHEAT YOU GET A pair of leveling lift kit for chevy,100% satisfy aftersales service. 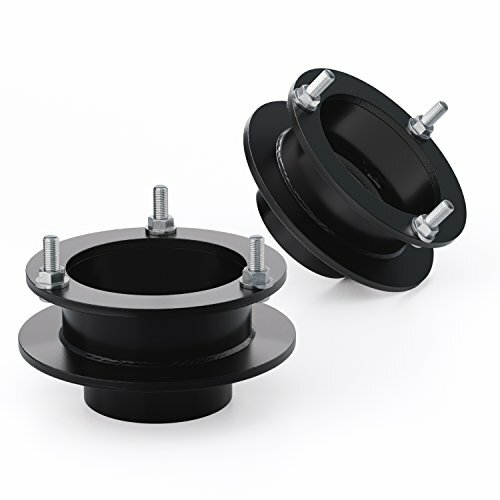 FITMENTS 2.5 inch leveling kit for Silverado 1500,Chevrolet Avalanche 2007 2008 2009 2010 2011 2012 2013 Chevrolet Silverado 1500 2007 2008 2009 2010 2011 2012 2013 2014 2015 2016 2017 Chevrolet Suburban 2004 2005 2006 2007 2008 2009 2010 2011 2012 2017 Chevrolet Suburban 1500.The lift kit for ford f150 will raise your truck by 2.5" in the front,though the leveling kit being thinner than 2.5". The lift height and kit thickness are not 1:1 due to suspension geometry. BENEFITS The leveling lift kit's itself actual thickness 1.69 inch per side.2.5 LEVELING KIT Eliminates factory rake and perfectly levels the front with the rear of the vehicle.Gives a noticeably aggressive look to your truck. Provides additional fender clearance for larger tires and wheels. Maintains your original OEM ride quality, steering quality and driving comfort. 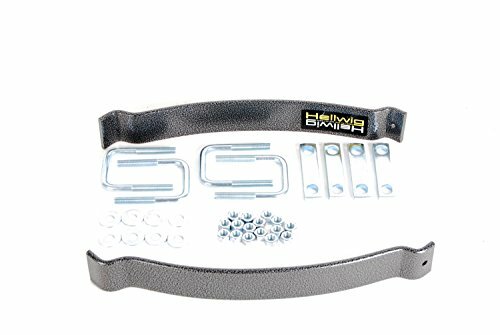 INCREASED SAFETY These LEVELING KIT FOR Silverado 1500 are Machine-manufactured precisely from 6061-T6 aircraft-grade aluminum billet,with heat-treated and hardened 10.9 grade bolts pre-installed. The anodized surface provides additional resistance to corrosion. Extraordinarily strong and light compared to spacers made of steel. 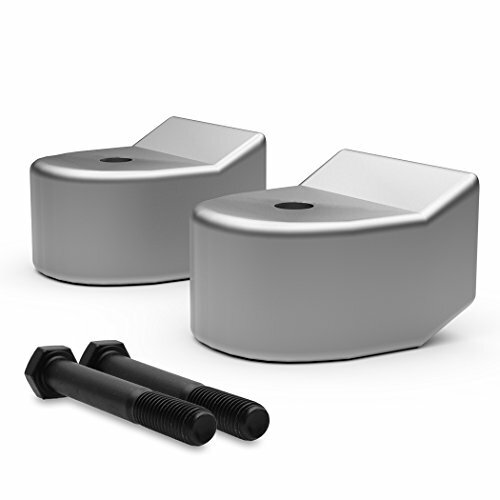 SIMPLE INSTALLATION The LEVELING LIFT KIT Chevy comes with everything needed for 100% simple bolt-on installation. The process requires no strut pre-loading,cutting,or modifying any factory parts,can be finished within 2 hours. WHAT YOU GET For these leveling kit for GMC,Full money back guarantee for Quality issues.Please feel free to contact us with not satisfition of the product or any question. The Load Pro series has 750 pounds level load capacity. 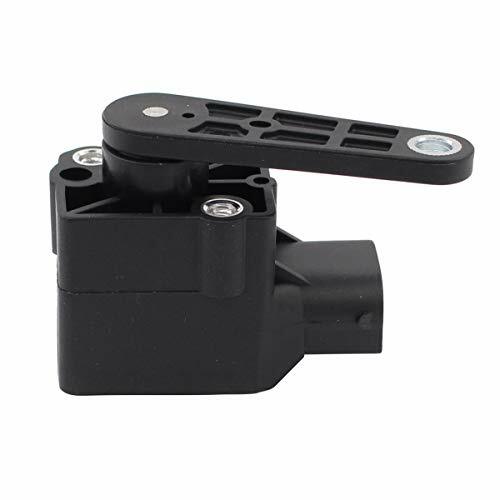 It has a greater control and stability in loaded conditions. Backed by lifetime warranty. It is a cost effective spring solution and includes high quality spring steel leaves. It is easy to install. FEARTURES--This kit will extend your stock shocks by 2". 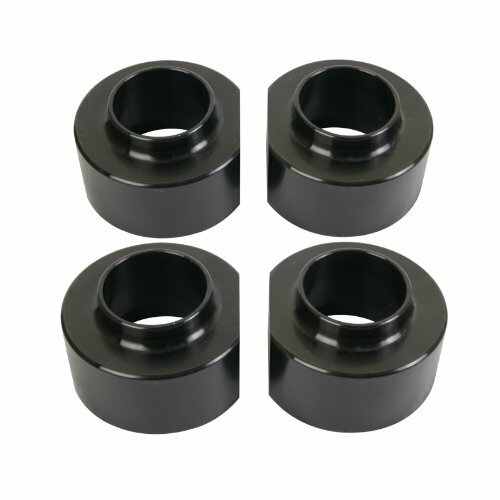 These front shock extensions will put your shocks back to the stock location after installing a leveling or lift kit. HIGH QUALITY--The front shock extenders are are CNC laser cut out of A36 steel and then powdercoated black to match you factory suspension. BENEFITS--Improve the performance of your vehicle and increases ground clearance,allowing you to fit larger custom rims and tires. 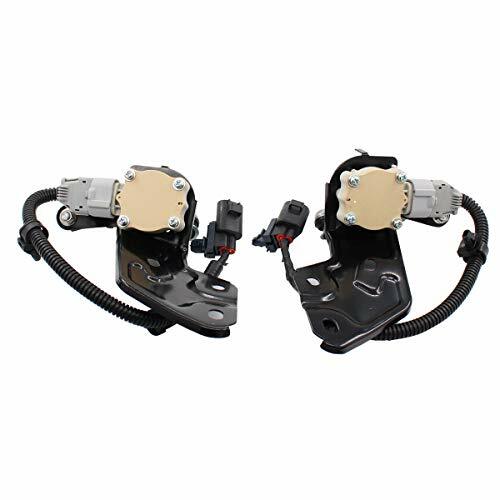 WHEAT YOU GET--A pair of front shock extenders,1 YEAR WARRANTY and 100% satisfy aftersales service. 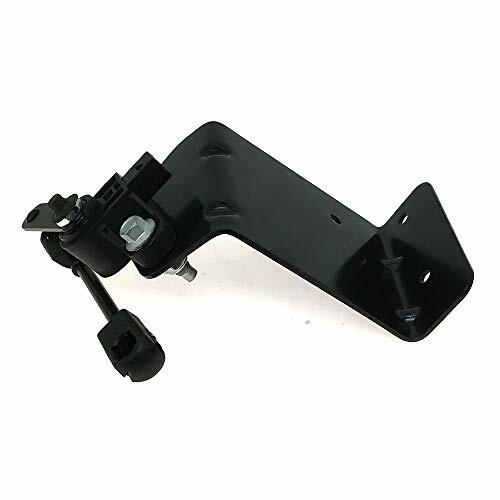 VEHICLE FITMENT:The 2" lift kits are compatible with 2001 2002 2003 2004 2005 2006 2007 2008 2009 2010 2011 2012 2013 2014 2015 2016 2017 2018 Chevrolet Suburban 1500 GMC Yukon Chevrolet Avalanche .2 inch leveling lift kit for CHEVY TAHOE 2001-2018. PARAMETER :The 2 inch lift kit for ford will raise your truck by 2 in the rear,though the leveling kit being thinner than 2. Factory shocks can be reused without compromising ride quality. Please note that spacer thickness to lift height is NOT a 1:1 ratio. We recommend that you measure your vehicle ride height before and after to see the full lift amount has been achieved. ADVANTAGES:The leveling kit 2 inch improves the looking of your truck and increases ground clearance, allowing you to fit larger custom rims and tires. CNC machined from solid Aircraft Billet for optimal performance. Provides additional fender clearance for larger tires and wheels. 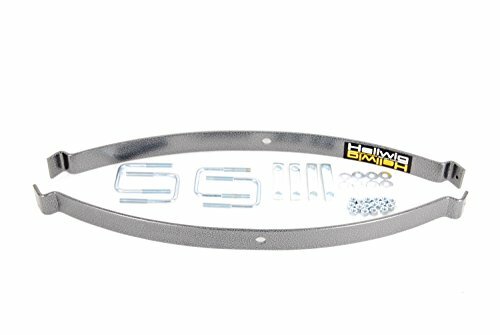 INCREASED SAFETY:These body kits 2 inch are Machine-manufactured precisely from 6061-T6 aircraft-grade aluminum billet, with heat-treated and hardened 10.9 grade bolts pre-installed. The anodized surface provides additional resistance to corrosion. Extraordinarily strong and light compared to spacers made of steel. Easy bolt-on installation takes 3 to 6 hours. No special tools required. AFTER-SALES SERVICE:We are responsibility for our customers and items.Money back guarantee for Quality issues. Please feel free to contact us with not satisfition of the products or any questions.